The columns you select define the input to your data target. If you are using the DMC to format a new data target, the order of the columns will reflect the order that the columns are specified in the SQL command. The DataMigrator Server, which DataMigrator uses to process its extraction logic, can have up to approximately 400 columns in a single data flow. If you intend to move more than 400 columns, several data flows may be linked together by creating a process flow. For information on process flows, see Designing a Process Flow. On the Home tab, in the Tools group, click Options. 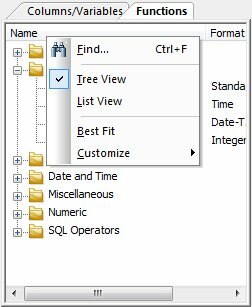 Select Data Flow Designer from the Data Flow tree. Select the Automatically select all columns check box in the On Add Source section. Right-click the SQL object in the data flow workspace and select Column Selection. The Column Selection window opens. Double-click the columns you want to select from the Available Columns grid on the left. Select one or more columns and click the right arrow. Tip: To select all columns, click anywhere in the column list, and press Ctrl + A. The columns appear in the Selected Columns grid on the right. You can change the order of the columns by selecting them and clicking the up and down arrows. Optionally, you can select the Distinct check box to remove duplicate rows from the results of your query. You can rename a selected column by entering a name in the Sql Alias field. To remove a column from the Selected Columns grid, select it and click the left arrow, or click the Delete button. Select the column you want to edit. Click the Edit column button, or double-click the number next to the column in the Selected Columns grid. Using the Columns/Variables and Functions tabs and the calculator buttons, edit the expression for the column. For information about using functions, see Using an SQL Function. For information about using variables, see Using Variables in a Flow. For information about creating a calculated column in the Selected Columns grid, see Creating an SQL Calculation. If a column in a source synonym has a description, that description will be carried over with the column into any new target synonyms. You can also use the Column Selection window to add descriptions for columns that do not have them, or to change the descriptions for columns that do have them. These descriptions will also be carried over into any new target synonyms in the current flow. From the data flow workspace, double-click the SQL object, or right-click it and select Column Selection. Double-click the Description field for the column in the Selected Columns grid. To access the Column Selection window from the data flow workspace, double-click the SQL object, or right-click it and select Column Selection. Removes duplicate rows from the results of your query. Find. Opens the search dialog. Field View. Switches views of the synonyms. List View. Switches views of the synonyms. Best Fit. Optimizes the column widths for best viewing. Column naming display strategy. Controls the information that appears in trees and grids. The available options are Name, Title, and Description. If no Title or Description exists, the display will default to the Name. Note: When in List View, clicking a column heading will sort the column grid on that heading. Note: The symbol for a virtual column in the synonym is blue, while the symbol for a transformation (virtual column in the flow) is yellow. Is the name of the column. Next to each column name, there is a symbol that indicates regular columns, key columns, index columns, virtual columns, and transformations. Is the name of the data source. Is the format of the column. Is the description of the column. Indicates whether the column can contain NULL values. Adds columns to the Selected Columns grid. Deletes columns from the Selected Columns grid. Lists the columns to be extracted from the data source(s). Is the column name, or an expression created in the SQL Calculator. Is an alternate name for referencing the column. If you add an alias and expression, the expression shows up where the column name would normally be. Is the aggregation applied to the column. The available options are: Group By, Group By Not Selected, Sum, Min, Max, Count, Avg, Sum Distinct, Count Distinct, and Avg Distinct. Allows you to search for a column. Opens the SQL Calculator to create a column. Opens the SQL Calculator to edit a column. Tests the SQL statement and displays the result. Note: The test button will be grayed out if you have not selected any columns. Moves the selected column up or down within the Selected Columns grid. Resizes the column to fit its data. Allows you to select what information is displayed for each column. Opens the SQL Calculator where you can edit the properties of a column. You can aggregate your columns in the Column Selection window. Select the column or columns you want to aggregate. To select more than one column, hold the Shift or Ctrl keys while selecting columns. Group By. Groups the data by each distinct value in the column. Group By Not Selected. Groups the data on (or by) the column that you do not want to appear in the results. Sum. Adds the values within the column. Min. Returns the minimum value found in the column. Max. Returns the maximum value found in the column. Count. Returns a count of all non-null column values. Avg. Returns the average value for the column. Sum Distinct. Adds the distinct values within the column, excluding duplicates. Count Distinct. Returns a count of all distinct, non-null column values, excluding duplicates. Avg Distinct. Returns the average value for the column, excluding duplicates. Note: If you apply an aggregate function to one of your selected columns, the rest of the selected columns must, in most cases, have aggregation functions applied, or be GroupBy columns. After an aggregation is applied to a column, all columns without an aggregation turn red until an aggregation is applied to them as well. Performs a calculation. For details, see How to Create a Calculation. Designates a constant value for a column. Uses a variable to calculate a column. For details, see How to Create a Column That Uses a Variable. In the Column Selection window, click the Insert Columns button. Enter the calculation you want to perform using the Columns/Variables and Functions tabs, and the calculator buttons. For details, see SQL Calculator. For information about using functions, see Using an SQL Function. For information about using variables, see Using Variables in a Flow. In Alias, enter an alias for the column. The calculation appears in the SQL Expressions field. Note: When you create expressions, keep in mind their order of evaluation. For details, see Order of Evaluation. Optionally, select an aggregation for the column in the Aggregate field. For details, see Aggregating Columns. You can type a calculation directly into the Selected Columns grid by double-clicking the SQL Expressions field. You can type an alias directly into the Selected Columns grid by double-clicking the SQL Alias field. Click the Insert Columns button. Type an alias for the virtual column. Double-click the variable you want assigned to the column from the Columns/Variables tab. You can also type in character-valued or date-valued variables, which must be enclosed in single quotation marks (‘). The variable and alias appear in the Selected Columns grid. For more information about using variables, see Using Variables in a Flow. To access the SQL Calculator from the Column Selection dialog box, click the Insert Columns button, or select a column and click the Edit Column button. Is an alias for the column. Opens the Filter SQL Optimization Report, which allows you to specify settings for, and run, the report. Verifies the validity of the expression. Allows you to search for a function or variable by name. Displays available columns and variables in a hierarchical tree or in a grid. Displays a list of SQL functions that are available for your transformations. Allows you to specify parameters for the function through a dialog box when creating or editing a transformation. Inserts two single quotation marks (‘). Enter alphanumeric test values between these. Converts selected text to uppercase. Converts selected text to lowercase. Opens the Date Editor window, which lets you use the current date or specify a date from the calendar. Opens the Date Editor window, which lets you use the current date and time or specify a date and time from the calendar. The following table describes the result of an operator on an expression, where expr is an expression. Returns the sum of two expressions. Returns the difference of two expressions. Returns the negated value of an expression. Returns the product of two expressions. Returns the dividend of two expressions. Returns the concatenation of two character strings. You can use an SQL function in the SQL Calculator to create a complex expression. In addition, most ANSI 92 SQL functions can be used in a SELECT command, depending on the data source type and platform. In the SQL Calculator, click the Functions tab. Double-click the folder for the type of function you want to use. Double-click the function you want to use. The Function Assist dialog box opens. Use the Function Assist dialog box to set the parameters for the function and click OK. The function appears in the Expressions window. Click OK. The function is added to the Selected Columns grid of the Column Selection window. For more information about the Assist dialog box, see How to Use Function Assist. Functions in the SQL Calculator Functions tab can be viewed by category (Tree View) or alphabetically (List View). Right-click the Name header bar to select between the two views, as shown in the following image. Returns the length of arg in a character string. Concatenates the values of two arguments. Converts a numeric expression to a fixed length character string. DB2 only. Edits a numeric or character value according to a format specified by a mask. Converts a character string value to lowercase. Identical to LOWER and LOWERCASE. Removes leading spaces from a character string. Returns the location of substring in arg, or returns a zero if substring is not found. Removes trailing spaces from a character string. Returns a string from arg starting at start-pos to the end of the string, or if specified length characters. Removes leading and/or trailing spaces and other characters from a character string. The character to be removed may be specified as trim-char. If it is not, the space character is assumed. Whether to remove leading and/or trailing characters may be specified as trim-where. If not, both leading and trailing spaces are removed. Converts a character string value to uppercase. Identical to UPPER and UPPERCASE. Returns the date in YYMD format. Returns the current time of the operating system in the form, HHMMSS. Returns the current timestamp of the operating system (date and time) in the form, YYYYMMDDHHMMSS. Returns the current time zone. Converts the value of its argument to a specified data type. Length is an optional integer that specifies the length of the target data type. Converts a number to a character string, or data value to a string in a specified format. Returns a date, time, or timestamp value that is computed from arg. Converts a number into a fixed-length decimal where dec-places is the number of decimal places in the result. Converts arg to a floating point value. Converts a number to an integer. Identical to INTEGER. Converts a number to a small integer. Converts its argument to a time. Converts its argument to a timestamp. Converts its argument to a vargraphic. Returns a number that contains the day of the month from a date or timestamp. Returns the number of days since December 31, 1900. Extracts a numeric value from a date or time value arg, where field is either a year, month, day, hour, minute, or second. Returns the hour field from a time or timestamp value. Returns the number of microseconds from a time or timestamp value. Returns the number of milliseconds from a time or timestamp value. Returns the number of minutes from a time or timestamp value. Returns the number of the month in which arg falls. Returns the second field from a time or timestamp value. Returns the year in which arg falls. Produces a column whose values are incremented row-by-row by a specified amount. Converts its input value to hexadecimal. Note: This function is available only for DB2, Ingres, and Informix. Tests a condition and returns a value based on whether the condition is true or false. Returns the number of bytes of storage used by arg. Returns the user ID running the query. Returns the absolute value of a number. Returns the natural logarithm of the input value. Returns the square root of the input value. Returns the first number raised to the power of the second. Returns e raised to the power of the argument. Allows a value to be computed depending on the values of expressions. Allows a value to be computed depending on the truth or falsity of conditions. Can take two or more arguments. The first argument that is not NULL, is returned. If all arguments are NULL, NULL is returned. Tests if subquery returns one or more rows. Returns NULL if its two arguments are equal. Otherwise, the first argument is returned. Determines whether a specified value matches any value in a list. Used in a select list to return a column value. Returns result set based on subquery. Determines whether a specified value matches any value in a subquery.